Our countertop selections are endless. The kitchen countertop options are typically laminate, solid surface, and stone. Laminate has made a comeback in the past few years with the addition of “High Definition”. 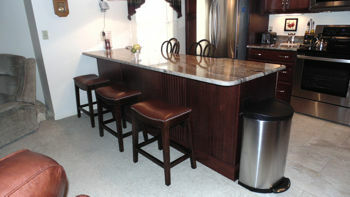 The finish that is applied gives the client the look of Granite, Marble, or Quartz without the expense. The laminate world still has the biggest selection of colors and there are 10 edge options to pick from. With the stone market becoming so competitive today, we have seen the solid surface market decline. Most clients are selecting the shine of Granite and Quartz over the dullness of solid surface. We carry many different manufactures of Quartz. Cambria (American Made), Hanstone, Viatera, and Silestone are some of the options. The advantage of Quartz is the durability to heat, scratching, staining, and is virtuously maintenance free. Natural Granite has improved over the last few years with the addition of the fabricators applying an “impregnated sealant”, which guarantees the stone not to stain. Granite gives the client the most chance for uniqueness in their kitchen, due to the fact that every slab is naturally different. In bathrooms, the 3 main types of countertop selections are Cultured Marble, Granite, or Quartz. Cultured Marble can be ordered in many different colors and patterns. The main benefit is the integral sink options, the tops are completely seamless. Natural Granite and Quartz have become popular options due to the fabrication of 3/4″ thick stone. This gives the consumer the options of real Granite or Quartz without the heavy price tag. Client’s typically select the undermount china sink options with these types of countertops.